Let the naysayers think what they want: PC gaming is far more affordable and infinitely more fun than gaming on consoles. Yes, the initial hardware cost may be higher, but even an average gaming PC far exceeds the graphical fidelity of the latest Xbox and PlayStation, and the modding scene, which is just starting to form around a handful of console games, has been going strong on the PC side for decades, giving us numerous highly acclaimed modifications that have exceeded the quality of the original titles. Regardless of whether you’re looking for a replacement for your aging gaming rig or you’re just thinking about joining the PC Master Race™, we have for you five gaming desktop PCs for under $1,000, which are guaranteed to give you the gaming experience no console can. With its price just edging the $1,000 limit that we’ve decided on before researching the available options for this article, the CyberPowerPC Gamer Xtreme is the most capable gaming PC that you’re going to find on this top-5 list. It can run the most demanding PC titles, and it meets the requirements for both the HTC VIVE with Steam VR and the Oculus Rift VR, allowing you to experience virtual reality games and applications. 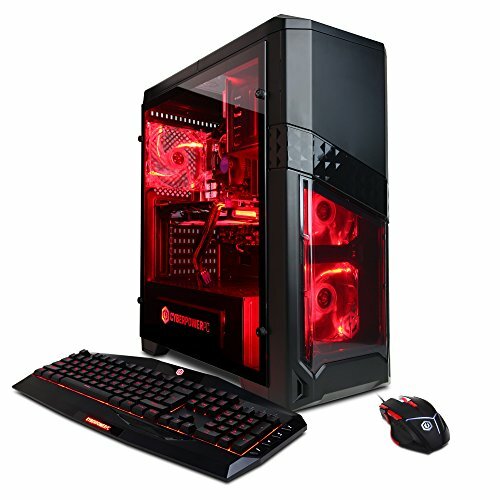 The components selected by CyberPowerPC for this rig include a 7th Generation Intel Core processor with four cores clocked at 3.6 GHz, 8 GB of DDR4 memory, 1 TB hard drive, and a GeForce GTX 1060 graphics card with 3 GB of dedicated video memory. If we were asked to recommend one upgrade, it would be a fast SSD in addition to the 1 TB hard drive. While the large storage space is great for data archiving purposes, modern games greatly benefit from fast, low-latency storage, and so does the Windows operating system and many desktop applications. The ASUS GR8 II-T069Z mini PC attracts with its unique case, which hides desktop-class components. More specifically, a 7th Generation Intel Core i5-7400 processor with 16 GB DDR4 memory, 802.11ac Wi-Fi, 512 GB M.2 SSD, and a customized ASUS GeForce GTX 1060 graphics card for uncompromised graphical fidelity. Besides being gaming-ready, the ASUS GR8 II-T069Z mini PC is also multimedia-ready. You get the SupremeFX HD audio system with Sonic Studio III and Sonic Radar III for immersive sound, and the ultra-quiet thermal chamber design provides optimized cooling for up to 23 percent quieter operation compared to similar systems. If you own any AURA Sync-enabled products, like Claymore keyboards and Gladius mice, you can synchronize the RGB lighting of the ASUS GR8 II-T069Z mini PC with the RGB lighting of your peripherals and components. 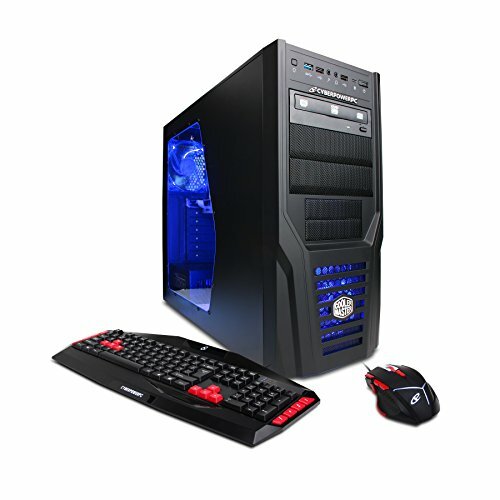 The CybertronPC Palladium GTX Gaming PC is one of our favorite mid-range gaming rigs because of its affordable price and specifications without any major compromise. The combination of the Intel Core i5-7500 3.2GHz processor with 16 GB of memory ensures that even the most demanding professional applications, such as Adobe Photoshop or Premier, won’t lag. And with a NVIDIA GeForce GTX 1050 graphics card with 2 GB of dedicated memory, you can play all the latest AAA games on the medium settings at 60 frames per second. CybertronPC went with a 2 TB hard drive instead of a smaller and faster SSD, and we understand the reasoning behind this decision. The Palladium GTX Gaming PC would make an excellent family computer for anything from web browsing to online gaming, so it makes sense to exchange some read and write speed for storage space. Included with the computer is a fairly standard keyboard and a simple computer mouse, neither of which is perfect for competitive gaming. The SkyTech ArchAngel is an imposing gaming rig. 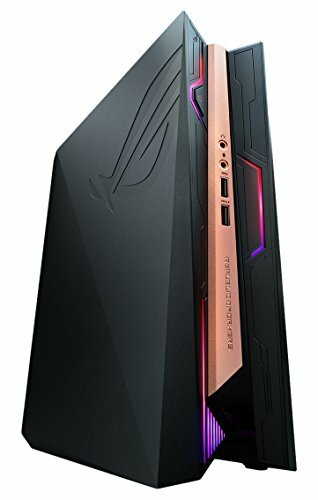 Unlike the previous three computers on this list, the SkyTech ArchAngel features the FX-6300 processors from AMD and a gaming motherboard with the AMD 970 chipset. We don’t want to go too deep into the differences between Intel and AMD here, but the gist is that AMD processors tend to offer comparable performance to similar Intel processors while being more affordable, particularly in the mid-range category. Where AMD processors sometimes fall short of Intel processors is heat management, power consumption, and support for modern technologies. In other words, your typical AMD processor is more like the AK-46 assault rifle, while your typical Intel processor is closer to the M16. Besides the AMD processor, the SkyTech ArchAngel also offers a 1 TB hard drive, 8 GB of memory, and a NVIDIA GeForce GTX 1050 Ti graphics card. 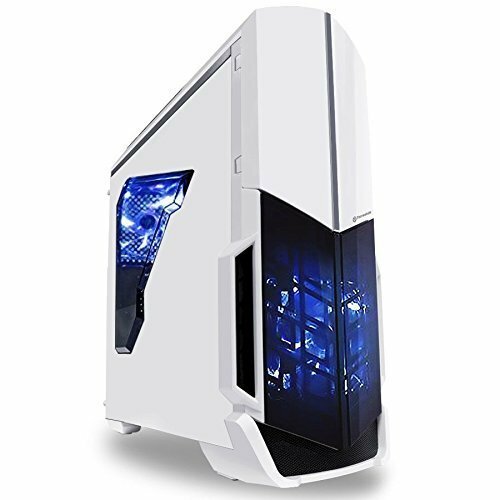 All the components are housed inside a beautiful white case with blue LED fans and a side window for gazing inside the belly of the beast. The last desktop gaming PC on this list is also the most affordable one. Just like the SkyTech ArchAngel, the CyberPowerPC Gamer Ultra GUA880 has an AMD processor, the FX-4300, and a motherboard with an AMD chipset. Being a more affordable gaming PC, you only get 8 GB of RAM, but it’s super-easy and super-affordable to add another 8 GB. Unfortunately, you don’t get an AAA-capable graphics card like you get with the previous four computers features on this list. The NVIDIA GeForce GT720 is a low-end graphics card that can only handle the most casual games out there and not much more. 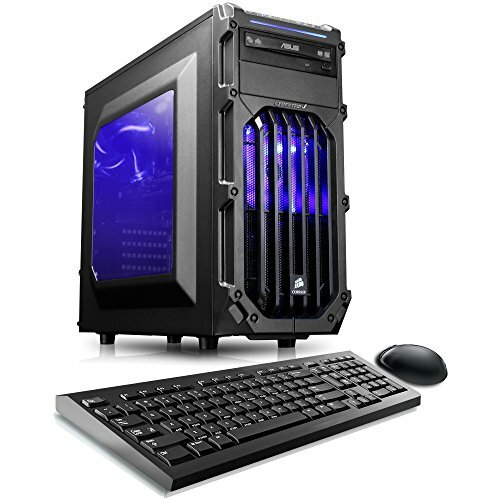 As such, think of the CyberPowerPC Gamer Ultra GUA880 more as a multimedia PC than a true gaming PC. Or better yet, think of it as a gaming PC for young children who are content with playing Minecraft and other easy-to-run games.